Shaw House Urban Plaza Level 1 was the place to be on a cool November Saturday night as both members of the public and invited guest and media were in high spirits as everyone waited for the highly anticipated light up ceremony to begin. As every Singaporean knows, Orchard Road is the place to be every year end as the retail belt is decorated in lights and various decorations to celebrate the season of giving. It was no surprise that as the clock ticked closer to the arrival of the guest of honour, Mr President Tony Tan Keng Yam, the whole Urban Plaza was buzzing with activity. The Boys Brigade turned up smartly in their uniforms as they lined up to welcome the president while members from the Super Trouper Choir from MINDS Lee Kong Chian Gardens School were all ready on stage. Saluting to attention as the President walked in, the boys from the Boys Brigade gave their smarted salute as everyone clapped to show their appreciation to Singapore’s head of state for making time off his very busy schedule to attend the light up ceremony. As the President got to his seat, the Super Trouper Choir warmed everyone hearts with renditions of familiar tunes heard during Christmas. It is no easy feat for these students and their teachers due to their disabilities but they gave their best and the applause that came after their performance was testimony to it. Mr Tan Puay Kern, Chairman of the Christmas on ‘A Great Street’ 2013 Light-Up Ceremony 2013 organising committee thanked long time partners for their donations which will go a long way in helping the many beneficiaries that the Community Chest helps. Mr. Kiyoaki Iigaya, Chief Executive for Asia, Hitachi, Ltd gave a short speech as well to show support for this meaningful event. As a treat for everyone, the every popular Dim Sum Dollies comprising Ms Selena Tan, Ms Pam Oei and Ms Denise Tan from Dream Academy gave a special sneak preview of the hilarious local theatre production “Crazy Christmas”. Even though it was a short performance, it definitely added to the whole festivie atmosphere that was filling up the event grounds. 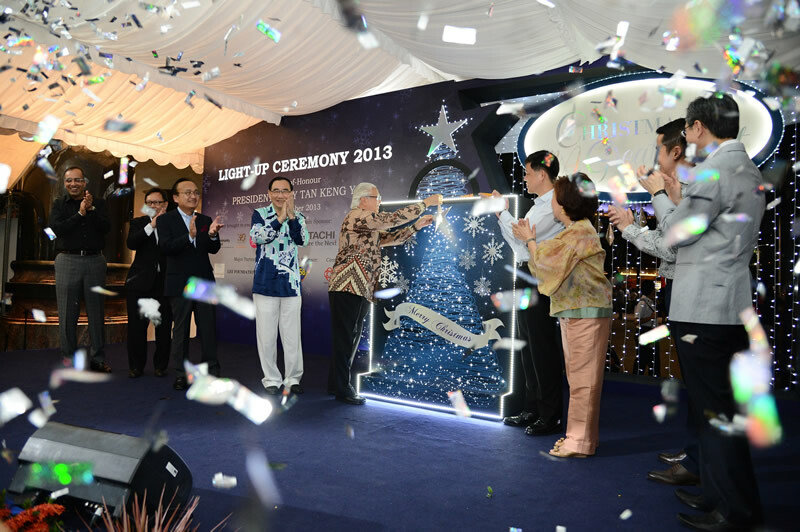 With everyone in the mood, the time has come to light up Orchard Road and with President Tony Tan putting on the final piece of oranment, Orchard Road lighted up to blue and white with giant diamonds and snowflakes. Giving a winter mood which is the common season for Christmas overseas, the Orchard Road Business Association (ORBA) have done a good job again this year. Not forgetting the many Shoppers who soaked up the atmosphere with Christmas tunes and were encouraged to pitch in with the light-up using Celebrate Christmas In Singapore battery-operated candles at both Shaw House and ION. Not only do these candles help to bring the Christmas mood closer on a personal level, ORBA has also pledged to donate $1 for each lighted candle. While the Light Up Ceremony may be something that everyone looks forward to as Singapore’s iconic retail belt, Orchard Road, dresses up for the festive season, it is also a good reminder to remember the less forunate among us.